Below are some common questions students and parents ask regarding on-campus housing and dining at PSU. If you can’t find your answer here, please contact us. Click on a tab to view questions and answers in that category. Plymouth State University believes there is significant educational value from the experience offered to students living in our Residence Halls. In keeping with this belief, all full-time matriculated students are required to live on campus if space is available. This policy is reviewed annually and adjusted in order to best meet the needs of the campus and community at large. All full-time matriculated students are required to live on campus for their first two academic years. Transfer students under age 21, by the beginning of the admitted semester, must live on campus for one full academic year. In general, this means all students who have earned 45 credits by the end of the January 2018 will be eligible to reside off-campus for the next academic year. Students who can show evidence of 2 (two) or more years of military service to be completed on or before September 1, 2019. *If you feel you have a unique and unanticipated situation or hardship, please contact our office for more information. Please DO NOT sign any lease agreement with off-campus landlords until you are certain you are eligible based on the appropriate Academic Year policy. Students may commute from a home owned by a parent/guardian or while living with a parent/guardian within a 50 mile commute of campus and with Residential Life written approval. Please contact Residential Life for appropriate commuter form. Can I move off campus after the first semester? No. Your lease with Residential Life is for the entire academic year (September – May). You must fulfill this obligation unless you are released for academic purposes. Where can I read the lease agreement? You can view lease agreements here. All first year students will live in one of the six traditional residence halls as part of the First Year Residential Experience, including Blair, Belknap, Grafton, Pemigewasset, Geneva Smith, and select rooms in Mary Lyon. Where do continuing students live? Continuing students are eligible for housing in Res North, including the University Apartments, Merrill Place, Langdon Woods, and select rooms in Mary Lyon. Can a continuing student room with an incoming first year student? Upper division students may not room with traditional first years, due to the FYRE-First Year Residential Experience, however they may reserve a space for a transfer/new student who is also an upper division student-sophomore status or above. Am I able to have a roommate who is not a student? No. Anyone residing in campus housing must be a currently enrolled PSU student. Priority is given to full-time matriculated students. During the summer Plymouth State operates many conferences, events, and special functions that utilize the residence hall facilities. In addition to those functions we also take this time to renovate, repair, and clean the facilities. As a result, it is typically not possible to move in to your residence hall before the published opening day / time. Knowing this, we ask that you coordinate your move-in plans well in advance of the fall semester opening by arranging for transportation and, if needed, having family members available to assist you. For any additional questions, contact the residence director of your hall. Students who are on fall semester athletic teams that are required by their coaches to return early, as well as students attending the early Community Service Orientation already have specific and special arrangements in place for earlier arrival. The specific details regarding this will be shared with you in advance by your coach or the program coordinator in advance. What are the housing rates? In order to reserve a space on campus, eligible students are initially charged a reservation fee equivalent to the double room rate. Once an actual assignment has been made, billing may be adjusted based on the assigned room rate. Also, students who are required to be on a meal plan but did not choose one, will be placed on the default meal plan and billed accordingly. What are the available meal plans? Visit the Dining Services page to see the available meal plans and details. Due to limited cooking facilities, all students living in a residence hall are required to be on a meal plan. The restricted meal plan is only available to students who have fulfilled the live-on requirement. For more information, please go to the Meal Plan Prices and Options web page. A swipe is equivalent to a meal (breakfast, lunch, dinner, meal exchange or On the Go). Swipes are used in Prospect Dining Hall or in the on-campus cafes offering meal exchanges and On the Go options. How do I find out how many dining swipes are left on my meal plan? Next time you have your id swiped for a meal, ask the person doing the scanning how many dining swipes you have left. You can also check this on the GET App or webpage. I'm running out of dining swipes, what do I do? Please stop by the ResLife office in the garden level of Mary Lyon and we can talk about what the best option is for your situation. Throughout the semester we allow the purchase of a higher-level meal plan, additional blocks of swipes, or adding flex cash to your account. 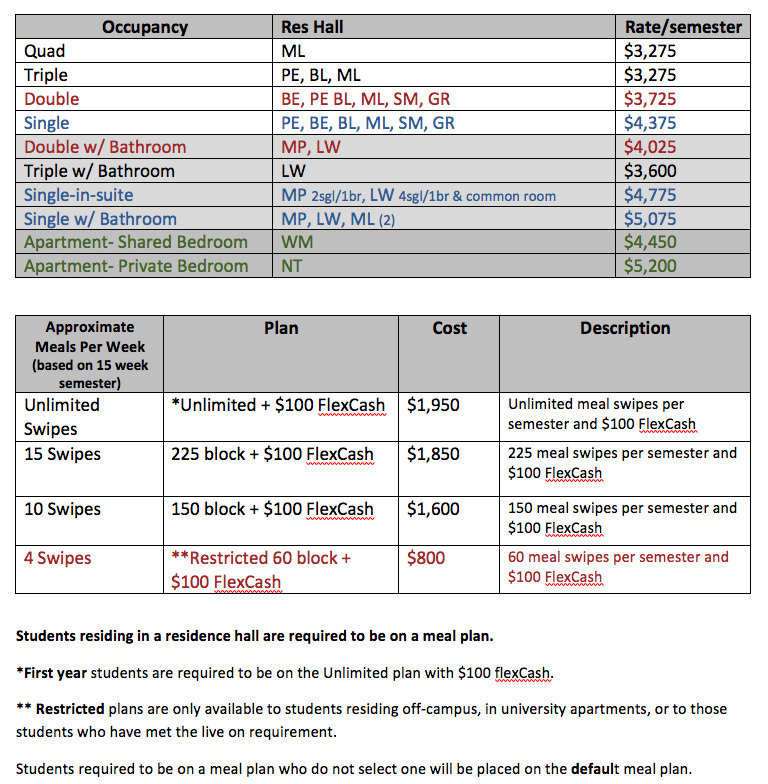 If you are running out of dining swipes for the current semester, you may want to reconsider now which meal plan you should choose for next semester. When school is in session, you must stop by the ResLife office in Speare to discuss your options. You may always change to a higher meal plan or change your meal plan for next semester. If the deadline for the current semester has passed, you may not cancel or change your meal plan to a lower plan unless there are extenuating circumstances; you may discuss this with the staff at ResLife. I tried changing my meal plan online and it won't let me, what's up? You may only change your meal plan online when school is not in session. To change your meal plan during the semester, please stop into the ResLife office in Speare. What if I have a vacancy in my assigned room? Any vacancies in rooms/suites/apartments may be filled by residential life at any point throughout the year with or without notice. If students have a vacancy and have a preferred roommate in mind, they should contact Residential Life as soon as possible in order to reserve the space. It is important that students maintain open communications with their roommate(s) in order to identify potential vacancies and make timely arrangements to pull-in a new roommate or perhaps explore a reassignment. How do I get assigned a room? All first year students will live in one of the six traditional residence halls as part of the First Year Residential Experience, including: Blair, Belknap, Grafton, Pemigewasset, Geneva Smith, and select rooms in Mary Lyon. Continuing students are eligible for housing in Res North, including the University Apartments, Merrill Place, Langdon Woods, and select rooms in Mary Lyon, and are able to select a space through the Housing Selection Process. Residential Life encourages all students to find a preferred roommate through the application process. There are many ways to search for a roommate: search by detail, search by profile questions or browse matching roommates. Many students also search for a roommate through social media. If you already have a roommate in mind, simply share your housing application screen names and then use the search by detail tool. How do returning students choose housing? Returning students who want to live on campus and those required to live on campus based on the live-on policy, will choose housing during the Housing Selection Process. The housing selection process takes place after spring break. PSU students will receive a series of emails throughout the spring semester with information about this process. Important note: Students who are required to live on campus based on the live-on policy for the corresponding academic year, must choose on-campus housing or obtain written approval from Residential Life to commute. When will I know my assignment? Assignment information will be available beginning in late July for the fall semester. Students can check for the latest assignment information by retuning to the confirmation page of their housing application. Please note that if you do not see an assignment it simply means that an assignment has not been made yet. Assignments are made throughout the summer. All students who have paid the room deposit by the due date will be granted housing starting in the fall semester. Most assignments will be available by late July, however, we assign students throughout the summer. Assignment information will include residence hall/area, room/apt/suite number and roommate information. Please check your assignment information often as changes may occur throughout the summer. Can I change my room after I move in? We have a two week room freeze at the beginning and end of each semester except in emergencies. We encourage roommates to work out their differences, but we do allow room changes after the first two weeks. You will need to submit a Room Change Request Form and your Community Director will set up an appointment with you to discuss options. 1st year students are only eligible for a room change within their assigned residence hall for the fall semester. 1st years may request a room change within any traditional residence hall for the spring semester. Upper division students may request a room change within any ResNorth hall/area for both fall and spring semesters. Note: Room changes are not allowed for the 1st and last 2 weeks of each semester. Student will set up check-out and check-in times with appropriate CDs. Student will meet with Community Director to check-in and obtain the new room key, temporary building access card (if applicable), and to complete the room inventory. Student will move belongings to new room within 24 hours. All belongings must be moved during this time. Student will meet with current/exiting Community Director at the prearranged time to return keys, and to complete the check-out and room inventory. The Student will visit Student Account services where applicable. Reassignments with an increase or decrease in room rate will be billed /credited the appropriate pro-rated amount on their student account. No same day moves allowed. If a key is provided on Friday, the move needs to be completed by Monday. The move cannot take place during quiet hours. Please check quiet hour policies in specific buildings. Failure to abide by Room & Hall Change Procedures may result in revoking a student’s ability to change rooms and/or a fee assessment- up to $25/day. Can I build a loft in my room? Although homemade lofts are not permitted for use in our residential facilities, students may rent a loft from Residential Life, depending on their bed type. Once you know your assignment, contact your Community Director for more information. All housing areas provide appropriate beds for students. Beds styles may consist of individual units, bunk beds (which can typically be used bunked or un-bunked), or loft units (which are single beds with an area below for a desk). All mattresses require the use of twin extra-long sheets. Can I bring my own rug? Yes, you may use your own rug: rugs are not provided in the residence hall rooms except in Langdon Woods. It is important to first measure the floor in your assigned room to determine an appropriate rug size. In Langdon Woods all rooms are carpeted. Can I decorate the walls? Adhesives that do not damage the wall paint are acceptable to use when hanging items on the walls of the residence halls. Students should not use sticky tak or any devices that put a hole in the wall (charges will be assessed at the end of the year for any damage caused). Can I have a refrigerator? Yes (Energy Star if possible). It needs to be approximately 5 cubic ft. or smaller. Interested in purchasing or renting a refrigerator? Click here! There are shades covering all windows, but window sizes vary. Approximate window sizes and room dimensions can be found on individual residence hall information pages. All beds have at least 1 foot of clearance from the bottom of the bed to the floor. What furniture is provided in the rooms? Each bedroom will be furnished with an extra-long twin bed, desk and desk chair, dresser and closet/wardrobe space for each student. Closets/wardrobes will be shared in triple rooms. What sizes are the mattresses and beds? Mattresses are 80” in length. Beds are 6ft 8 inches long, 3ft wide, and have 1 foot (sometimes more) of clearance from the floor. All of the beds on campus require extra long sheets for the best fit. If you have difficulty finding extra long bedding, please visit Residence Hall Linens. Residential Life has partnered with Residence Hall Linens for over 16 years to ensure that PSU students and families have a convenient, affordable way to get sheets that will fit the extra-long mattresses in our halls. The Residence Hall Linens program has all your campus living needs, from extra long twin sheets and comforters to matching towels and storage items. Proceeds from this program are used for programming in the residence halls. Shipping is free for all Value Pak orders, and there are more than 40 color combinations available. Plus, linens are delivered to your home during the summer so you don’t have to worry about waiting in line at the store. Order now for the best selection – popular colors can sell out quickly! Please visit the RHL website www.rhl.org/pls or call (800) 957-4338. The following lists will be helpful when new students shop and plan for there campus room. We recommend that students work out some of the details in advance with their roommate to avoid duplication on some of the larger items! For more information, go to the campus Room Furnishings page. Do I need insurance to cover my belongings? Yes, you should check your personal coverage. The University is not liable, directly or indirectly, for theft, destruction of property, or loss of money, valuables, or other personal property belonging to a student. All students are strongly encouraged to carry personal property insurance or to review appropriate family insurance coverage. Many family homeowner policies include this type of coverage. National Student Services, Inc. provides personal property insurance to students nationwide. Your one-time premium nets you coverage for an entire year, and this coverage begins the day after you apply. Visit their website where students can also apply for coverage to protect their property, renew or modify existing coverage, and obtain all the information they need about NSSI program. Due to the prevalence of cell phones, land-line phones direct to student rooms are no longer provided. Emergency phones are located in central locations in the residential halls, as well as other campus locations, for 911 emergency calling. Will my room have cable TV? Internet? All residence hall rooms have cable and computer network access. PSU has wifi available in all campus buildings and outside in most areas. Click here for more information about ResNet, connecting to the PSU network, and the Cable TV channel offerings. Are there any smoking residence halls? All residence halls are non-smoking. Laundry facilities are located in each building. Wash prices begin at $1.60 but may vary depending on the cycle options chosen. Dryer cycles may be purchased for $.55 per 20 minutes. Machines are started through use of money on your student ID (FlexCash). Machines do not take quarters. All washers are high-efficiency, front-load machines. Please use only detergent designed for this style machine. Each building has at least one kitchen facility for student use. Check the Residence Hall info for more specific details. There is no storage space available in the residence halls for personal belongings. Students should plan and pack accordingly. What forms of transportation are available on and off campus? ALL students are allowed to bring cars, which is just one of the many great reasons to come to PSU! Anyone who plans to park on campus will need to purchase a parking permit through University Police. For questions about parking permits, call campus police at 603-535-2330. Plymouth State University has a shuttle system that runs through campus and town at certain hours. For more information, go to the campus Shuttle Service Info. Concord Coach Lines provides limited service to different towns surrounding Plymouth as well as Concord, Londonderry, Boston, MA and Logan Airport. For more information please visit their website www.concordcoachlines.com or call 1-800-639-3317. Students are eligible for special fare pricing. They pick you up right in town, a very easy walk from campus! Whom do I call with questions about Orientation? Call the Center for Student Success @ 603.535.3065 with any Orientation questions. Select downtown merchants now accept FlexCash for food and non-alcoholic beverages.